Two photos in one day, you can tell it’s Saturday and the wee lad is fast asleep in bed for a while. Obviously it’s too early for any sporting events on tv so all the normal distractions are well out of the way. Isn’t it amazing how sports channels fill up Saturday mornings with utter rubbish while they wait for anything interesting to happen. Anyway, I digress, apologies for that. I actually took this photo way back in July 2007, one of my earlier forays into the magical work of infra-red photography, I must admit at this stage it was all down to trial or error. I reckon I could easily come back home with at least 30 shots of exactly the same scene, I will never bemoan the onset of digital photography again, you simply can’t do that amount of experimentation with film unless you’ve just won the lotto and the prize comes with its own free darkroom. Imagine the amount of film I would have to carry around with me for a full day out in the park. I suppose I could get the young fella to follow me around with a wheelbarrow full of film for me. I also suppose I could do a fair amount of processing in Photoshop but yet again, that’s just not for me, you either record the shot exactly as you want it or you have to go back again another day. Anyway, to say I personally love this photograph is a bit of an understatement. I truly love the symmetry of the perfectly upright trees juxtaposed with the one stray almost semi-circular branch right smack bang in the middle of the shot. I just couldn’t have asked for a better scene……well one or two fluffy Irish clouds would maybe have added to it. 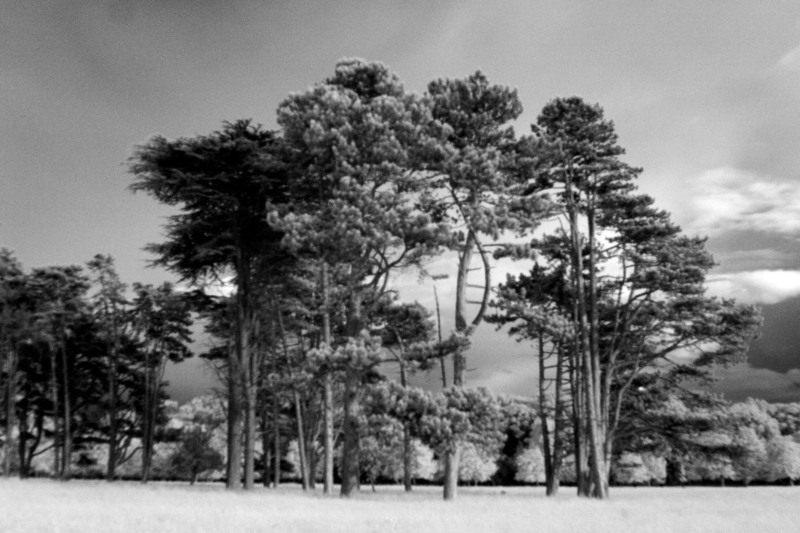 This entry was posted in Black and White Photography, Infra-red Photography, Irish Landscapes, Phoenix Park and tagged Black and White, Dream Like, Infra-red Photography, Photography, Tall Trees, Wide Angle. Bookmark the permalink.